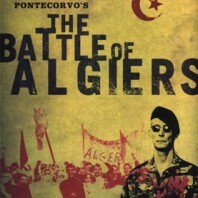 In many ways, Gillo Pontecorvo’s Oscar nominated masterpiece The Battle of Algiers plays more like a documentary than a feature film. 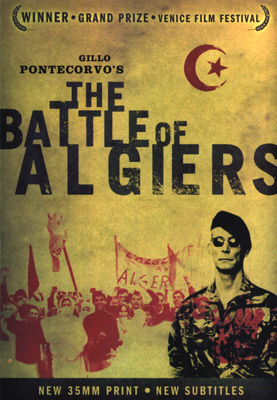 Tracing the bloody war that was waged in the late ’50s and early 60s between the native Muslims of Algiers and their French colonisers of one hundred and thirty years, the film is based on a true story by Saadi Yacef, a resistance leader who features in it as FLN boss Djafar. Yacef also co-produced the film giving the production unlimited access to the maze of narrow laneways that make up the city’s Casbah and to the people of the city who came on board as extras in their thousands. We see the resistance stir when a street hustler named Ali La Pointe (Brahim Haggiag) is abused by French citizens then hauled off to jail where he witnesses the execution by guillotine of an unrepentant freedom fighter. Five months later he is enlisted to join the underground movement and is soon shooting policemen dead in the streets along with many of his comrades. But when a French Commissionaire and his colleagues set off a bomb which kills many innocent women and children, retaliation comes swiftly. In a brilliantly tense sequence set to the rhythm of war drums by legendary composer Ennio Morricone, three Muslim women transform themselves to pass as French and slip through the barricades with handbags laden with explosives. One by one they plant them in a café, in an Air France office and in a trendy dance club. Their detonation causes mass bloodshed and it is here that the clinical French Paratroopers are called in to systematically eliminate the resistance by whatever means they deem necessary – and that includes torture, or as they call it “interrogation”. By treating both sides of the battle equally, Pontcorvo presents an impressively balanced view of this historic fight for independence. Shot not long after the declaration of the Algerian nation in 1962, the film won the Golden Lion Award at the 1966 Venice Film Festival and has apparently recently been studied by the Pentagon for insights into how to deal with the Iraqis. Given the furore around Lynndie England, they would be wise not to follow the French tactics depicted in this film but rather acknowledge the simple fact that invasion is never viewed kindly by the natives.